Native Window (from Left to Right) Phil Ehart, Billy Greer, Richard Williams, David Ragsdale. A few weeks ago, a debut album was released from a band called Native Window on Star City records. Native Window consists of Phil Ehart, Billy Greer, David Ragsdale and Rich Williams. If any of these names ring a bell, they should. 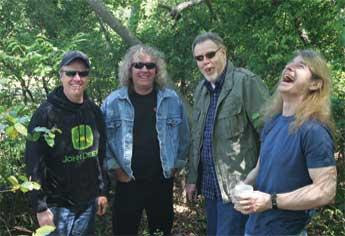 All four guys were, and still are, part of the progressive/classic rock band, Kansas. Native Window is the newest body of work from these talented musicians, who continue proving to the world that they’re far from being dust in the wind. Despite poor phone connections and airport static, I managed to get a few words of wisdom from drummer Phil Ehart. So how did the creation of Native Window come about? It started off as kind of a joke initially…We said, “We ought to just form our own opening band and go out as somebody else, than come back, change clothes and go out as Kansas.” Then we thought, “Hey! We could actually do that…” So the four of us decided to do this; come up with new material and have our own band name and everything. And what started out as rolling the dice turned out to be worth the bet, definitely. After Native Window was formed and before the recording process began, were there any initial fears or predilections you had, either as a group or individually, such as adjusting to the absence of keyboards in your music? I don’t think it was fear, it was just the unknown. We knew from the start if it didn’t work, we just wouldn’t do it. I was walking in everyday going “Gee, I wonder what it sounds like when all of us sing and what it would sound like without keyboards, etc.” But it was definitely the unknown. How would you guys initiate the writing process? Was it easier to write the music or lyrics first? Where would you draw some of your ideas from? With Native Window, it was really just pieces and parts. Someone would come in and say they had a verse idea that needs a chorus, or a riff that needs a melody on top of it, or chord structure, or middle part, or instrumental part…beginning, ending, title, lyric idea…You name it. Any of those things would come in and we’d take them and develop them and watch them grow. It was pretty cool. Can you describe some of the differences between Native Window and Kansas that you hope fans will recognize? Well for one thing, Steve Walsh isn’t singing and Billy is, so that’s a big change right there. I think the music is simpler and a little bit more straight-ahead; more melodic. And of course the background vocals are totally different. With myself, David and Richard singing all the background stuff, it’s a totally different sound than Kansas has ever had. The violin may remind you of Kansas, and of course we all have played in the band Kansas, but the music is not Kansas. I guess the biggest compliment that we could get is, “Wow, this doesn’t sound like Kansas at all!” “Well, thanks!” That’s a good thing cause that’s what we strived for… to step out of our own skin and comfort zone. Do you feel it’s more of a risk, forming a new band in today’s music industry after having prior success in an old one? Well, there are no risks left to take in Kansas. After 35 years, we’ve done everything we’re gonna do. So yes, Native Window is definitely a risk cause people will want to put you in that Kansas pigeon-hole, and I’m sure some Kansas fans will listen to it and go “It sounds nothing like Kansas! I don’t like it!” But that’s fine, Native Window isn’t for everybody. How has the music industry changed in your eyes, today vs. 35 years ago, and how does it still affect the way you make music? Well, the good news is our heyday has come and gone. And because of that, stuff doesn’t affect us much anymore. We don’t have to worry about being on the radio; we have a lot of songs that are on the radio everyday. We don’t have to worry about whether our tours are gonna sell out or not; we do 60, 70, 80 shows every year…We feel very fortunate and very blessed that we have that kind of track record. I wouldn’t say we’re bulletproof, but we just don’t have to worry about what the current status of the record business is. We put out a record and it sells what it sells. I’d hate to be a new band nowadays anyway; you just don’t get a chance to develop. If you’re not doing really well after your first album, you’re gone. They’re not gonna sit around and let you develop over 3 or 4 years. I mean, they have 300,000 bands on MySpace…300,000! Who even has the time to listen to a tenth of that? That’s just competition that back in the seventies we didn’t have. It’s very difficult nowadays…it’s much more of a disposable industry. Can you describe the contrast of playing to a crowd that has never heard your music before vs. playing songs to a crowd that knows your words by heart? (Laughs) It’s definitely a contrast. Playing in front of an audience with some of the biggest songs in rock music, to playing songs where most people probably haven’t heard a note…it’s definitely daunting. But that’s ok, we knew that going into it and we knew we had work to do. We still have our day job. You can purchase Native Window’s self-titled album online and in stores, and be sure to check out some of their music on their Myspace page.